Carnival and Brittany Ferries expect to be operating new ships on LNG full-time. Carnival-owned AIDA Cruises and Brittany Ferries have made news with their LNG-fuelled ships. US and UK-listed Carnival Corp announced December 19 that its new Tenerife cruise terminal in the Canary Islands, Spain, played host the previous day to the maiden call of AIDAnova, which it described as “the world's first cruise vessel to be powered [both] at sea and in port by LNG.” The ship’s first refuelling on Tenerife took place on arrival Dec.18 by Shell, under a supply agreement inked 2016. AIDAnova (pictured in banner photo, courtesy of Carnival) welcomed its first paying guests in Tenerife at the start of their seven-day holiday cruise. The ship was originally due to have picked up its first guests in Hamburg Dec.2 on a maiden cruise reaching Tenerife Dec.12. But the handover by shipbuilder Meyer Werft of what was the first LNG-fuelled cruiseship to have been built in Germany was instead delayed from November until Dec.12. The distinction 'first cruise vessel powered at sea and in port by LNG' is open to interpretation. Some ferry operators like Balearia are operating their luxurious ferries on LNG already, as have some shorter-haul ferries in Scandinavia for a decade. But AIDAnova is nonetheless a big ship and Carnival's investment is substantial too: not including AIDAnova, it has ten next-generation "green" cruise ships on order that will be powered by LNG in port and at sea with expected delivery dates between 2019 and 2025. 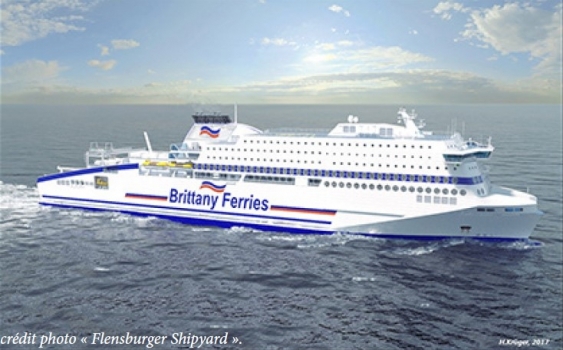 French-owned ferry Brittany Ferries meanwhile said its new LNG-powered cruise ferry Honfleur took to the water for the first time at a traditional ceremony on December 14 at the FSG shipyard in Flensburg, north Germany. Honfleur will carry up to 1,680 passengers and will offer 261 cabins and various cinemas, restaurants and other amenities and, when it enters service in the English Channel, will be the first cross-Channel ferry to operate solely on LNG. Its sea launch marks the start of the next phase of Honfleur’s construction, with two giant ‘mega blocks’ currently en route by barge from shipyards in Poland yet to be hoisted into position, followed by its interiors. It will then undergo sea trials before handover, with the first passengers on its Portsmouth to Caen/Ouistreham service expected aboard in summer 2019.